He: There is no reason the market has to do what you say. Me: What is the reason for there to be no reason? The history of the market is the history of forgetting. Thucydides’ comment in his introduction to The Peloponnesian Wars (circa 401 B.C.E) was, “I hope these words will be judged useful to those who want to understand clearly the events that happened in the past and which, human nature being what it is, will at some time or other and in much the same ways, be repeated in the future. That is my reason. Over the past hundred years, a series of empiricists, including Robert Rhea, Ralph Elliott, A. J. Frost and Robert Prechter have observed that the stock market reflects the recurring boom/bust nature of human economic behavior in a discernible pattern of advances and setbacks. Now, the prospect of the largest setback in our lifetime is upon us. 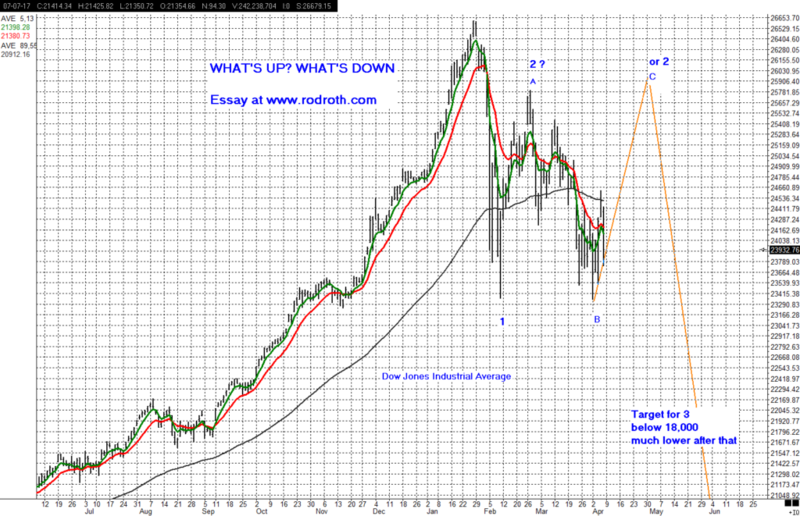 From my Elliott Wave Principle studies, I conclude that on January 26th of his year, the Dow Jones Industrial Average completed the five wave pattern of a Supercycle bull market. I expect that a bear market of similar degree is now underway, a situation that is not recognized by the investment community at large. It has been ninety years since the previous top of this magnitude. No investor alive has any recollection of the excruciating pain that followed, let alone any concern that such an event might happen today. Quite to the contrary, as is typical at major market tops, the prevailing investor sentiment today is complacency, which Merriam Webster defines as a sense of “self satisfaction especially when accompanied by unawareness of actual dangers or deficiencies.” We may hear lots of grousing about current events, but what matters to a serious market analyst is what people do with their money, and the great majority of individual and institutional investors remain fully invested with their percentage allocation to stocks the highest on record. Second highest, by the way, is to junk bonds, the riskiest of all investments to have in a severe downturn. They fall to zero. 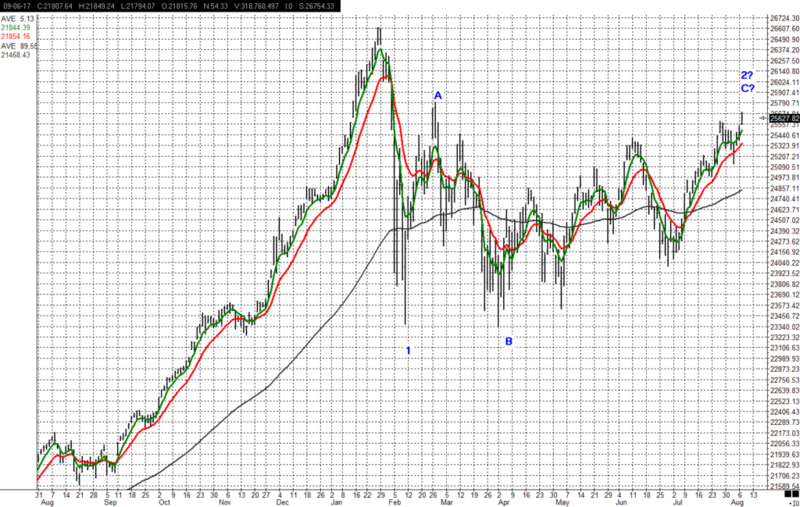 … as I messaged to my distribution list last week, the abrupt reversal on April 2 presents a second scenario. Instead of a sharp correction preceding the next impulse wave down, there may be another partial retracement, carrying the Dow back up around 26,000 or so before beginning the next impulse wave down. This won’t happen if the Dow breaks below 23,300 soon. Either way, the next wave of selling will be a killer wave, dropping six or seven thousand points. If my analysis is correct, a Wave 2 “Flat” correction should be complete with a final push up slightly above the A Wave high of 25,800. The First corrective wave in a new bear market can retrace a good percentage of the Wave 1 down, reflecting the still very strong bullish investor sentiment. And bullish it is! More bullish than at the all time top, by some measures. This, too is typical. The most recent advance in the correction, from May to the present, has occurred on steadily declining breadth and volume. These are characteristic features of corrective waves. In short, the stage is set for a horrific crash that, with intervening sharp rallies that stop at lower highs and then continue relentlessly to ultimately erase 80-90% of the values of the U.S. stock market. Further, in case you haven’t noticed, virtually all of the other markets in the world have already entered bear phases. Realistic market forecasting must be done probabilistically. I have high confidence in this call, but if the market were to make new highs, I’d certainly reassess my position and post a new forecast. We hold short term government notes and T Bills in our investment portfolios, and will until I see a solid bottom. As always, I make no recommendations about what you should do. This entry was posted in On Markets. Bookmark the permalink.